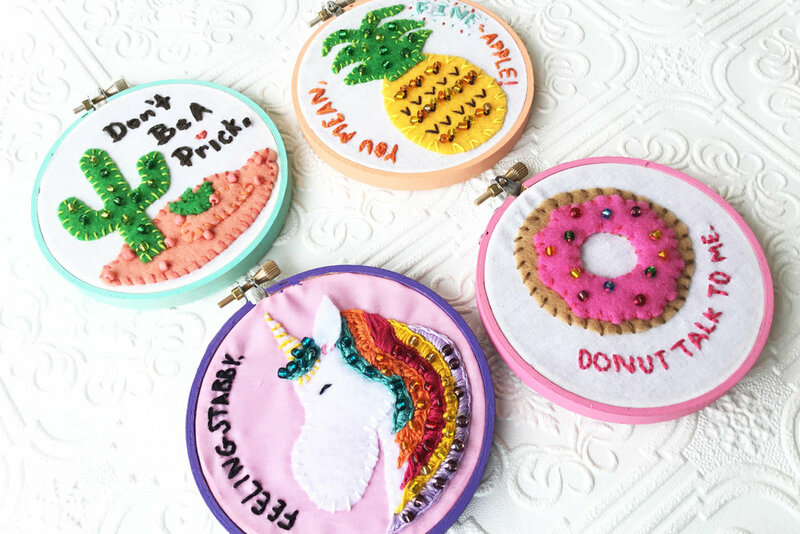 DIY Sassy Hoops — Crowned Sparrow Craft Co.
1. Using the screw top, separate the inner hoop from the outer hoop. Lay the fabric over the inner hoop, then push the outer hoop back onto the inner hoop over the fabric. Using the screw top, tighten the outer hoop and stretch the fabric so that it is taut. 3. Thread embroidery floss through the needle eye. (Use about 2 feet per color.) Knot at the opposite end. 4. Starting from underneath, push the needle up through the fabric and pull through, leaving a stitch space, then push the needle down through the felt & fabric, pulling all the way through. Continue around the shape until complete. Secure on the backside with a knot. Repeat for each felt piece. 5. Once all of the outside edges are secure, add embellishments using stitches and beads. Beads can be added during the upstroke of the needle, before pushing the needle with floss back down. 7. Starting from underneath, push the needle up through the fabric and pull through, leaving space, then pushing down along the traced letters. On the next stitch, move ahead along the letter and push the needle up and pull through. Then, bring the needle back to the previous hole and push the needle through, creating a solid line. Continue to stitch forward, then back to connect as you complete your letters. When finished, secure on the backside with a knot. Fine-Apple, Don't Be A Prick, Donut Talk To Me - You have the option to remove your fabric from the hoop and paint your hoop before finishing. 8. Using a piece of embroidery floss, thread your needle and knot at the opposite end. 9. On the back side of the piece, using only the excess fabric that is sticking out around the outside of the hoop, start about a 1/2 inch away from the hoop and stitch up through the fabric. Leave a space, stitch down through the fabric, leave a space, and then repeat continually around the fabric, creating a running stitch around the fabric on the outside of the hoop. Gently pull the thread so that the fabric starts to bunch and pull together to the inside of the hoop. Once all of the fabric is bunched together, secure by knotting the embroidery floss. Trim any excess fabric. 10. Hang your piece and enjoy!